We are HUGE crafters at our house. With four kids and a preschool, there is always glue, glitter, paint, chalk, scissors, etc. around the house along with a rather large mess. I love crafts for kids, for my kids to be creative, express themselves, and explore with different craft mediums. My girls have gotten a little past the preschool art projects, and we’ve found 5 fantastic crafts that they have LOVED, that are a step above your basic arts & crafts. 1. Chalk Murals – Block backyard fences are nothing more than empty canvases to be decorated. With simple sidewalk chalk, my kids have spent hours creating masterpieces after masterpieces. The sky’s the limit! (or the backyard fence of hundreds of blocks!) When they are ready to create again, just wash the chalk off and start all over again. 2. Nature Art – Crumpling up a piece of paper over and over gives the fabric feel to the background. Then your kids can add whatever leaves, twigs, weeds that they want to create their masterpiece. 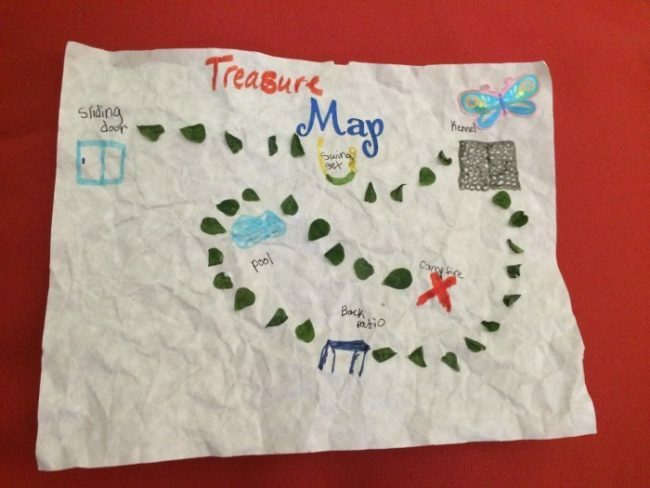 Here, my kids made a treasure map for their cousins to find a reward. A mix of markers and leaves let them to the X that marks the spot! 3. 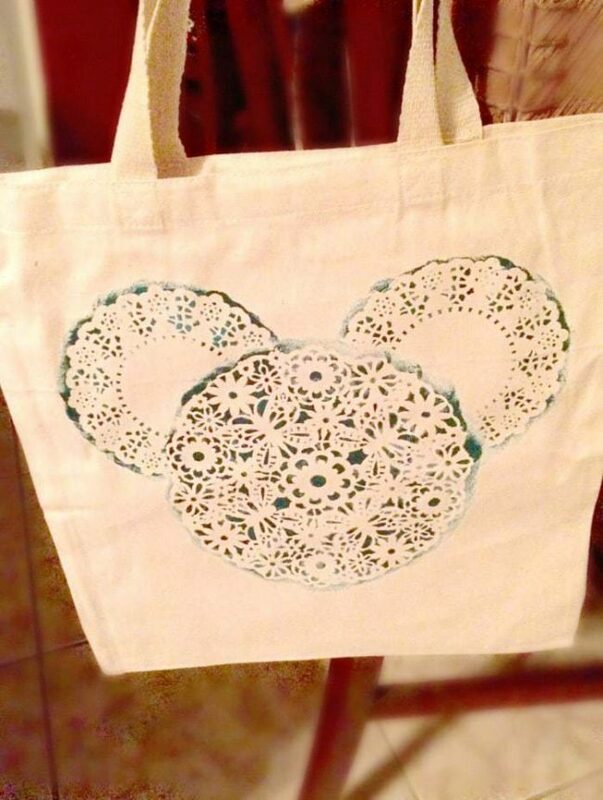 Canvas Bags – A craft simply made with a canvas bag, doilies, a sponge-brush and paint. Tape down the doilies in whatever design they like, and remember that a tiny bit of paint goes a long way. Mix up the colors and the parts of the doilies that you paint to create your own masterpiece that they can show off everywhere. 4. 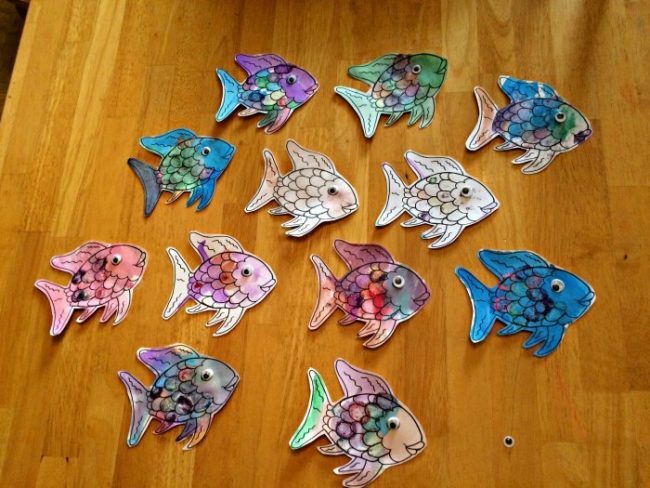 Glitter Rainbow Fish – We love to mix mediums in our crafts. For our glitter rainbow fish, we printed out a black and white design off the internet onto cardstock. We painted them with watercolors, and once they were dry, added glitter glue to make the fish really sparkle. What a unique school of fish we created! 5. 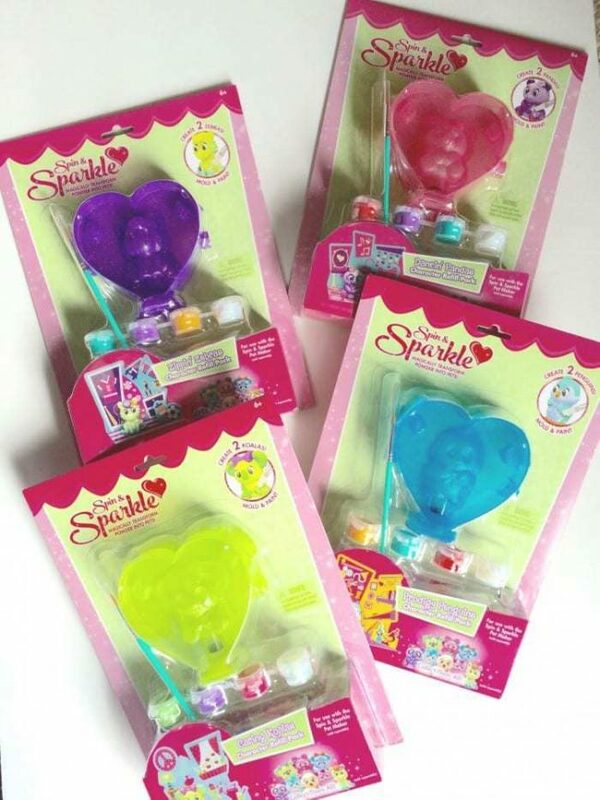 Spin & Sparkle Pets – Our family’s favorite craft yet! My girls have fallen in love with this product! And I love that it is something they are capable of doing by themselves. 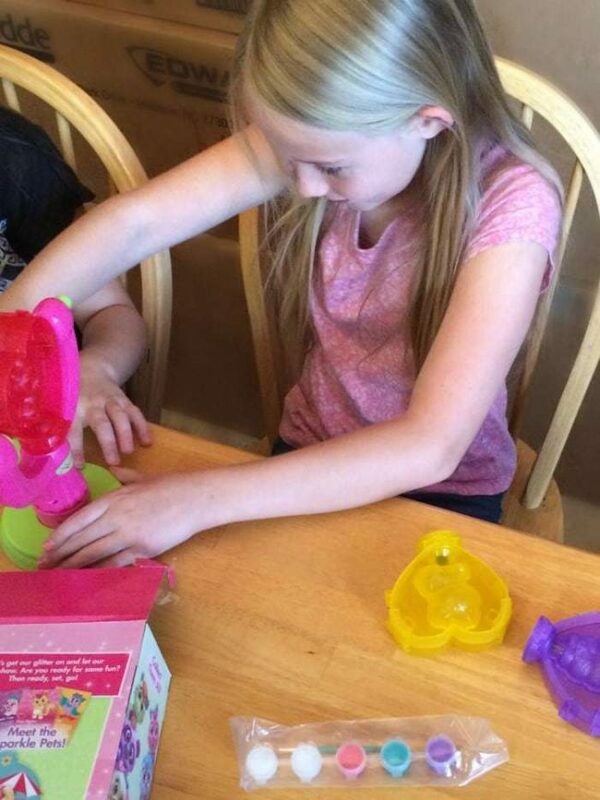 The pets are easy to make, the girls can customize them however they want, and they can play with the toys afterwards! 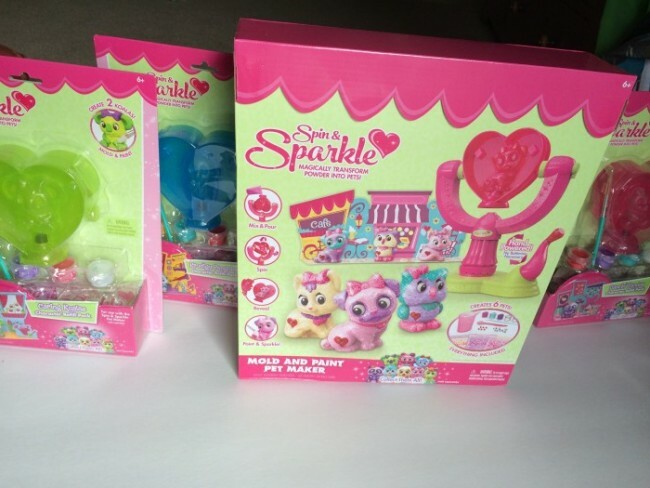 The Spin And Sparkle Pet Set allows such great creative expression, and they can do the crafts on their own! All they do is add water and the magic caste powder into the mold and spin the handle for a couple minutes to create the pet form (no batteries needed). After 2 minutes, your pet is formed, and you have to let it dry. Once the pet is completely dry (about 20 minutes), you can create, customize, and decorate however you would like with paints, glitter glazes and heart gems. The kit even comes with a pop up world to play with your pets afterwards! Not only do they get to create, but they can also play with their craft afterwards! RoseArt has a variety of pets to add to your collection. Your kids can collect all 11 pets! Hours of crafting fun and endless creativity! You can find these great pets from RoseArt! This set would be a perfect holiday gift, and I love that the set is new again with each additional kit! These five crafts have kept my kids engaged for hours! I love the free creative expression that they have with all of them, especially the Spin & Sparkle Pets. We’re having so much fun with them! I really like the tote. Any time kids can be creative it is a good thing. With something like the tote, they can make gifts for Aunts or Grandparents, or even have a community program. It is all great ideas. Too good and too awesome craft. i will surely recommended to my kids to try this. Amazing! I love doing crafts with the kids. These all look like fin ideas. 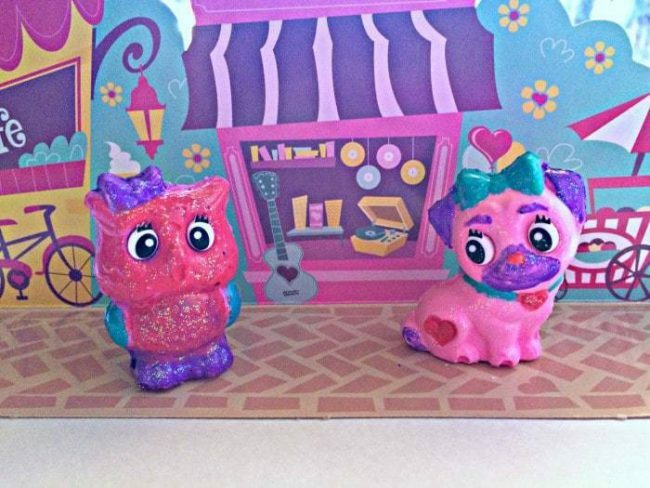 My kids would love the Spin and Sparkles pets. They look amazing and fun to do. My kids love doing all kinds of crafts. wow a cute post. and the girls are adorable. i love their poses. The chalk mural would definitely be one that my daughter and I could really get into. She loves doing things like that. Wow,very nice Crafts. Will suggest this to my Daughter, she will like it for sure. You have so inspired me to make sure I take some time during our winter break to get crafty with my 11 year old! He loves all of this stuff and I have been majorly slacking when it comes to crafting with him! I need to keep these in mind for holiday gifts for my daughter! These take me back to growing up! However, I haven’t thought about doing them with my kids! What a fun set of activities to do together! All your ideas look like lots of fun. 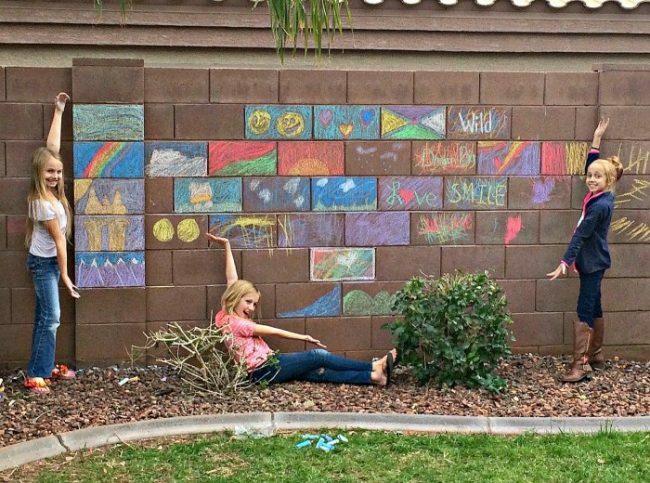 If I had to pick one activity it would be the wall chalk art, that looks like something we could do as a family. Awww, I love all of these! They are so cute. My daughter will love them so much! That pet set is too cute! 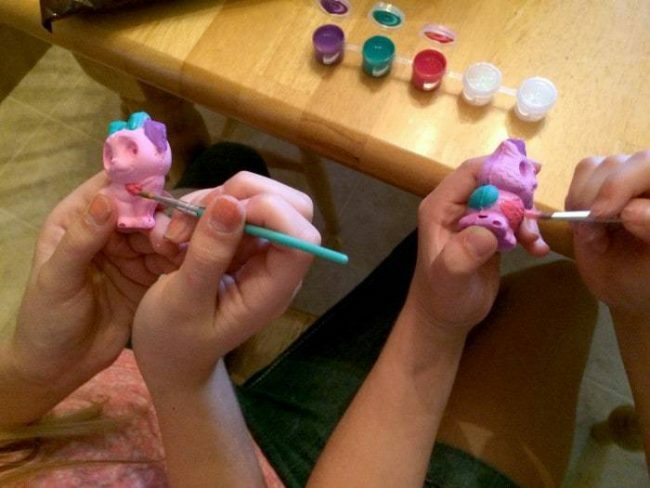 My kids would love to make their own little pets! These are great crafts for children. I was always drawing with chalk with my son when he was younger!! So much fun! My son would love that chalk mural. And it would keep him busy for hours! Chalk can go along way! We recently made a chalk wall for the kids and they absolutely love it! We have a ton of leftover chalk from summer. I will have to get the kids to do a big chalk mural this weekend. These are all fun ideas. 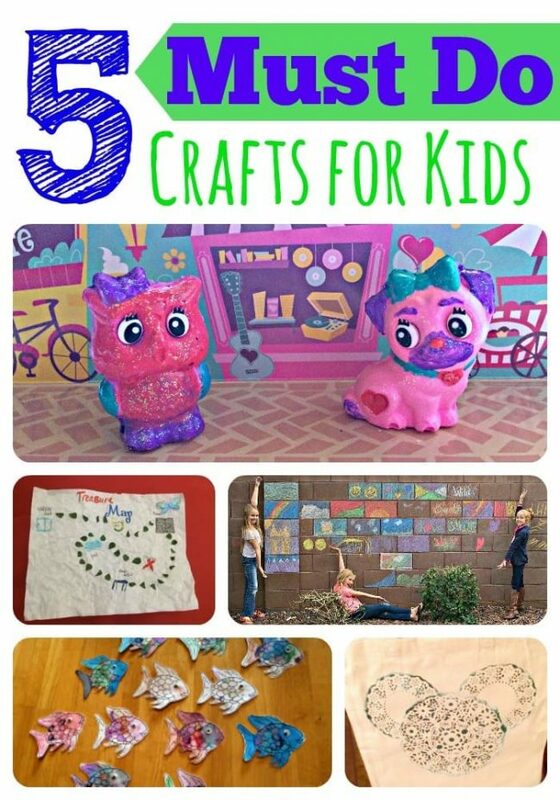 These are great crafts for kids. I was always drawing with chalk when I was young. These are all wonderful ideas. 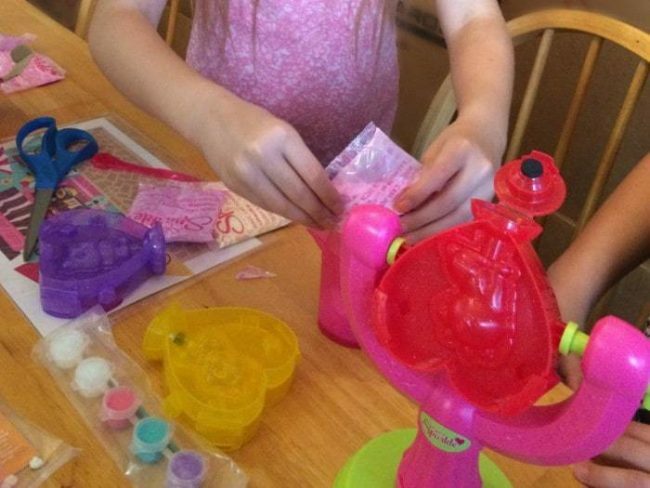 Crafting with the kids is one of the best ways to build life long memories and spark creativity. I love all of these ideas. I especially love sidewalk chalk. It gives the kids a gigantic canvas that never makes a permanent mess. I would love to do those chalk murals myself. I do have an artistic side, and I need to let it out. It looks like your children had such a fun time! I have a brick fence so I can do this also I never thought about it though I’m totally going to do it with my son. Thank you for the ideas.